Service Rank and Number / Rheng gwasanaeth a rhif: Lance Corporal No. 4280. Ref No Grave or Memorial / Rhif cyfeirnod bedd: Panels 13 and 14. Killed in action on Sunday 16 May 1915, aged 26 years during the Battle of Festubert, which took place south of Neuve Chapelle, Northern France. (Private 5089 Hugh Howell Davies, Private 11069 Joseph Davies and Private 5097 James Jones, who are remembered on the Rhyl War Memorial were killed in action during the same battle that day as was Private 58245 Frank Thomas, who is remembered on the Bagillt War Memorial). They were all members of 1st Battalion, Royal Welsh Fusiliers. William Jennings was born in Bangor, Caernarfonshire, North Wales in 1889. The 1901 Census shows that the family lived at 64 Victoria Road, Rhyl, Flintshire. The head of the family was William Jennings aged 35, a self-employed French Polisher. His wife Mary Ann Jennings (nee Gallagher) aged 33 and their four children – Theresa Jennings aged 14, William Jennings aged 12, Anne Mary Jennings aged 6 and Anthony Jennings aged 3 years. Their other son Thomas was living away from home in Llandudno, North Wales. Also living with the family at that time was Mary’s sister, Rose Gallagher aged 22 and her son Thomas Gallagher aged 1 year. On 6 February 1905, William now aged 17 years 5 months enlisted at the Recruitment Centre, Rhyl with the Special Reserve, 3rd Battalion, Royal Welsh Fusiliers. His Attestation Records state that he was 5′ 4″ tall, chest measurement 35″, expansion 3″, blue eyes, light brown hair. He had a tattoo of clasped hands over a heart on his left forearm. He gave his religion as Catholic. His physical development was described as good and he was passed fit for military service. During his time with the Army Special Reserve he did appear before the Commanding Officer of the Battalion on a number of occasions charged with offences of insubordination and drunkenness, which culminated on 15 March 1907 with being imprisoned for 1 month with hard labour at Ruthin Prison for an offence of Unlawfully and Maliciously Causing Damage to Army Property. He was later discharged from the army, but not dishonourably. On 14 April 1911, William who now lived at 2 Vale Road, Rhyl, Flintshire re-enlisted at Hightown Barracks, Wrexham, Denbighshire with 1st Battalion, Royal Welsh Fusiliers. He had a home posting from enlistment until Friday 18 September 1914, being promoted to Lance Corporal on Saturday 8 August 1914. On Saturday 19 September 1914 he travelled with the Battalion to France and was killed in action on Sunday 16 May 1915. The unit mustered 25 Officers and 806 men in the trenches that morning. Following a half-hour bombardment the unit attacked just after it ended at 3.16am, going over the top in successive order of 4 companies, 2 waves of men per company. Their aim (within the larger battle) was to take 2 lines of enemy trenches then hold a defensive position. It met heavy shell and machine-gun fire even as it left the trenches and tried to cross No Mans Land. They got beyond the two enemy lines but came under fire from their left, and part of the Battalion (A & part of B companies) was mixed up with the 2nd Scots Guards on that flank. The rear two companies (C & D) also suffered badly in crossing to the German lines. As some men pressed on further they were hit by ‘friendly’ shellfire and halted. By 1pm contact was made with the Royal Warwicks Regiment on the right and the Queen’s Regiment came up in support. The Battalion found itself holding an exposed position facing an orchard, open to enemy sniping from front and rear. At 2pm the enemy began shelling the trench they were in, which offered little cover. Reinforcements from the 7thLondon Regiment came up and attacked the orchard covered by fire from the Royal Welsh Fusiliers, but had to fall back under machine-gun fire. He shelling meantime wrecked the trench and cut the Royal Welsh Fusiliers off from other units. Darkness was approaching as the Royal Welsh Fusiliers fell back to a line being held just in front of the former Second German Line, then were ordered to withdraw to trenches being held by The Queen’s, which they accomplished successfully. The Royal Welsh Fusiliers claimed to have penetrated the enemy defences to a depth of 1200 yards. For this they paid a heavy price: Officers – 6 killed, 2 died of wounds, 9 wounded, 1 wounded and missing, 1 missing. Total 19 out of 25. Other Ranks – 118 killed, 271 wounded, 164 missing (many of whom would prove to be dead), 6 wounded and missing. Total 559 out of 806. Some 110 bodies were retrieved and buried in the old No Mans Land on 18 May, in addition to various officers brought in the previous evening. 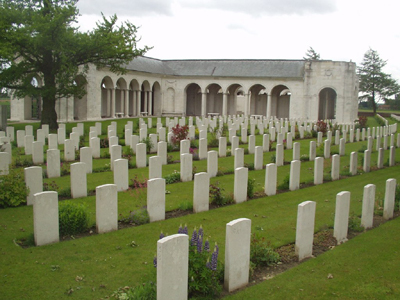 The RWF Archives have information that Lance Corporal Jennings received a gunshot wound to his right shoulder and was admitted to 10 General Hospital Rouen on the 1st November 1914 and was killed in action on the 16th May 1915. William’s elder brother Thomas is also remembered on the Rhyl War Memorial. He served with 10th Battalion, Royal Welsh Fusiliers and was killed in action in France between the 8th and 11th April 1917. William is also remembered on a Remembrance Plaque at The Royal Alexandra Hospital, Marine Drive, Rhyl, Flintshire and on The North Wales Heroes Memorial Arch, Deiniol Road, Bangor, North Wales. There is a Flintshire Roll of Honour Card for William Jennings at the County Archives Office, Hawarden, Flintshire which was completed on 16 September 1919 by a John Williams.